has decided this year to align its knowledge with that of master glassmaker, Olivier Juteau, to create a case that is equal to the house’s brand new vintage Sourire de Reims Brut 2007. 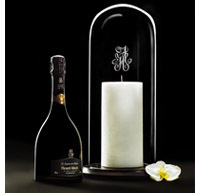 The bottle is presented beneath a mouth-blown glass cloche, topped with the initials of the Henri Abelé house. To taste: a blend of the best vintages of Chardonnay and Pinot Noir gathered in the Côte des Blancs and Montage de Reims regions. Candid, straight with notes of cloves of garlic and liquorice, this vintage is for those fanatics of complex wine.